As small business owners, you need to be capable of running a highly successful business. Combined with the changing dynamics in the industry brought about by corporate dentistry and consumerism it is clear that in order to thrive, the independent dentist must begin to operate as the CEO of their company. However, reading a book, or listening to a lecture is not enough to create measurable change in a practice. The timing is perfect (utilizing SSC’s experience in curated, local, interactive programming) for a series of programs covering all areas of business and financial management. The key is to bring useable, actionable business principles to the independent dentist that is comprehensive, accessible, and affordable. We’ve enlisted the expertise of some of the top business minds in the country to deliver a program that focuses on real business behavior change for dentists. And knowing that, as a director, your existing study club already meets at least 8 times a year, we’ve made it easy for you to schedule each Business Academy session. Five pre-recorded modules per year include interactive components to support learning objectives. Modules organized into suites designed to build on one another. On-demand format allows you to begin and end the suite’s curriculum when you choose. Members-only access to short video lectures, expert tips, and discussion forums. Podcasts and reading lists recommended by each content provider as supplementary materials to reinforce the teachings. Recruiting materials to help engage the interest of practitioners in your community including videos and brochures. Seattle Study Club’s educational model allows your club members to expand their knowledge base in a variety of ways, from our signature treatment planning discussions to problem solving workshops. Over the last few years, club members across the Seattle Study Club network have expressed a need for guidance in successfully managing a profitable practice. 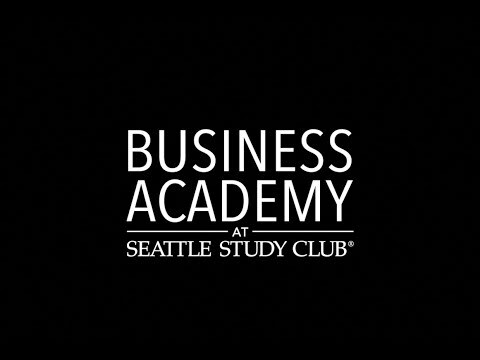 We’ve done our homework, found and recruited the experts, and are excited to introduce the Business Academy at Seattle Study Club. The inaugural suite is designed with specific topics to build a strong foundation and to engage as many dentists as possible. Based on feedback from our directors, we have built this initial suite to include those areas you told us were most relevant including leadership, cyber security and financial statements. After the initial suite, you and your group will choose the next suite you find most relevant. New Suites will be added every year. BONUS — 2 annual live stream sessions your members will be able to partake in, in the comfort of their own home or office, with updates and opportunities for Q&A with our world class content providers.